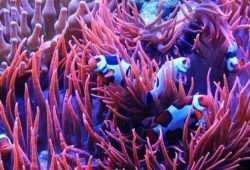 The article concerns the following question – Why Female Bettas Deserve More Attention. Given the stunning appearance of male Bettas, it isn’t surprising that female Bettas tend to get forgotten. However, they are interesting fish worthy of attention in their own right. While their fins are shorter than males, many modern females are quite brightly colored. Indeed, if they were a separate species I think they might be quite popular. Female Bettas are much less aggressive than male Bettas. This makes them better community fish. Female Betta fish can often be kept in groups provided the tank is fairly large. 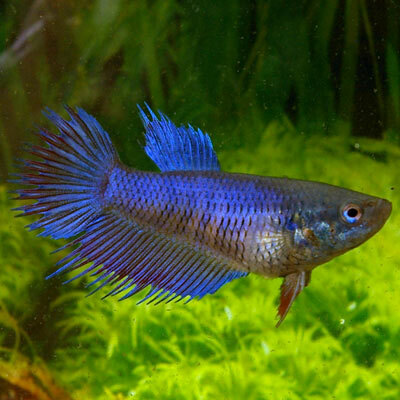 They can be a bit aggressive towards other female Betta fish or towards gouramis. The extent to which this is an issue depends on the individual Betta. In any case, aggression is much less of an issue than with males. Agression in female Bettas mainly consists of gill flaring at each other and some fin displays. They typically won’t hurt each other directly, but you may find that the less dominant fish gets stressed and becomes ill if one of your Bettas is much more aggressive than the other and the tank isn’t huge. For this reason, it is best to have a backup plan if you are keeping more than one female Betta in a tank of under 20 gallons. It is also better to keep a group of three or more rather than two because this means the dominant fish has more subdominant fish to bully and can’t concentrate exclusively on one fish. Plants and tank decorations that provide hiding places for less dominant fish are also good. The easiest situation is still to keep one female Betta fish in with other species. 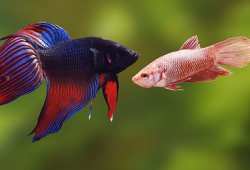 You are vastly less likely to experience problems with a female Betta bullying your other fish than with a male Betta, and because her fins are relatively short she is less likely to get her fins nipped. Female Bettas are not good tankmates for male Bettas because the males will harass the female until she mates. They then protect the bubblenest from all comers, including her. In the confines of the typical aquarium she could easily be hurt or killed. When breeding Betta fish, it is best to supervise the introduction of the female and mating. You can then remove her after mating is completed. If you have a very large aquarium, then it may be possible to keep a single male with a group of females, since he will have to split his attention between several fish and they will have room to get out of his way while he is guarding the nest. If you do, you should see some fascinating breeding behaviour. Be aware that in aquariums that aren’t large enough, he is likely to try to guard the entire tank. This is dangerous for the females. Female Betta fish have the same requirements as males in terms of pH, access to air, plants, temperature, and no fast water movement. They prefer mildly alkaline to acidic water and temperatures of 75F or higher. 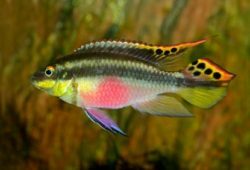 The female’s lower aggression makes these needs easier to meet as they are easier to place in an aquarium with other tropical fishes, filtration and a heater.